The HUMMING X is a piston type HFO artificial ventilator that is a successor to the HUMMING V and CALLIOPE α ventilators. In addition to a greatly improved ability in conventional ventilation, which has been a weak point in the past, the specifications for HFO ventilation have also been greatly improved. 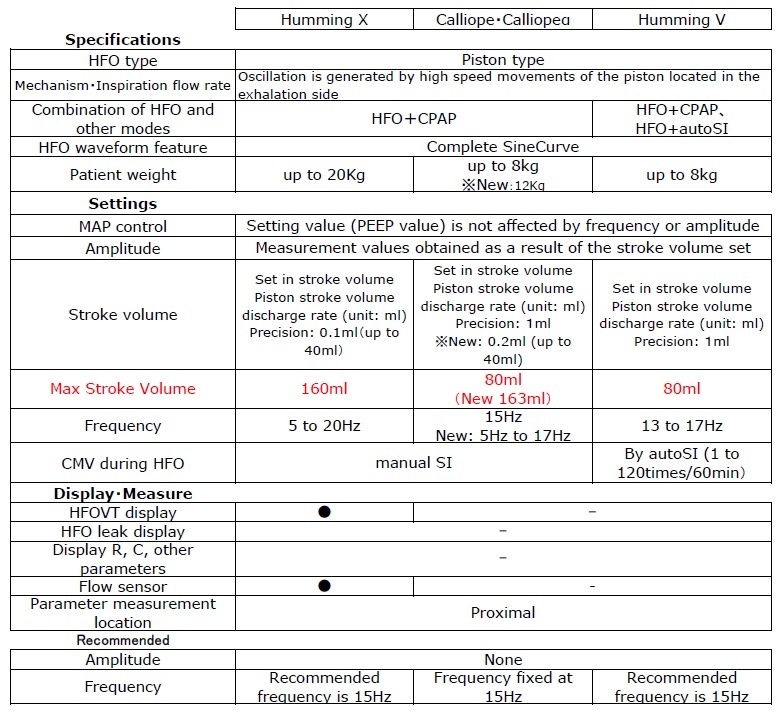 Regarding HFO ability, the maximum stroke volume or power of HFO has been increased, yet at the same time, it is possible to set the HFO stroke volume in increments of 0.1 mL. Even though the stroke volume has been increased, the sound level has been improved so much that it is almost unbelievably quiet for users who are accustomed to HFO. Moreover, with flow sensors located at the patient proximal side and within the ventilator itself, Patient Triggered Ventilation (PTV), Synchronized Intermittent Mandatory Ventilation (SIMV), Assist/Control Ventilation (A/C) and Pressure Support ventilation (PSV) became possible. Furthermore, ventilation monitoring became possible in HFO as well. Most operations are carried out using a highly visible liquid crystal touch panel display, which is combined with dial controls for basic items. As a new function, accelerometer sensors to monitor oscillation of the thoracic wall and abdominal wall during HFO are included as standard equipment, which will be evaluated in the future. With the Humming X, most setting changes including setting of ventilation and alarm settings are carried out by selecting the item on the touch panel display and then rotating the main dial. In the case of settings with unit values, you first select the setting by touching it on the LCD display, then turn the main dial to change the value, then confirm the setting by pressing the same setting or a different setting. 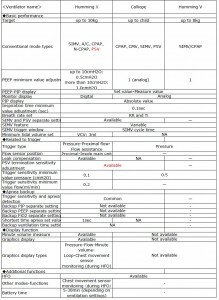 However, basic parameters including Fractional Inhaled Oxygen Concentration (FiO2) as well as oscillation frequency, MAP (Mean Airway Pressure) and SV (Stroke Volume) in HFO, and PEEP/CPAP and PIP in CMV (Conventional Mechanical Ventilation) can be directly preset with a quick dial. These items are not usually included in the touch function. CMV can include pressure-limited ventilation and volume-limited ventilation. 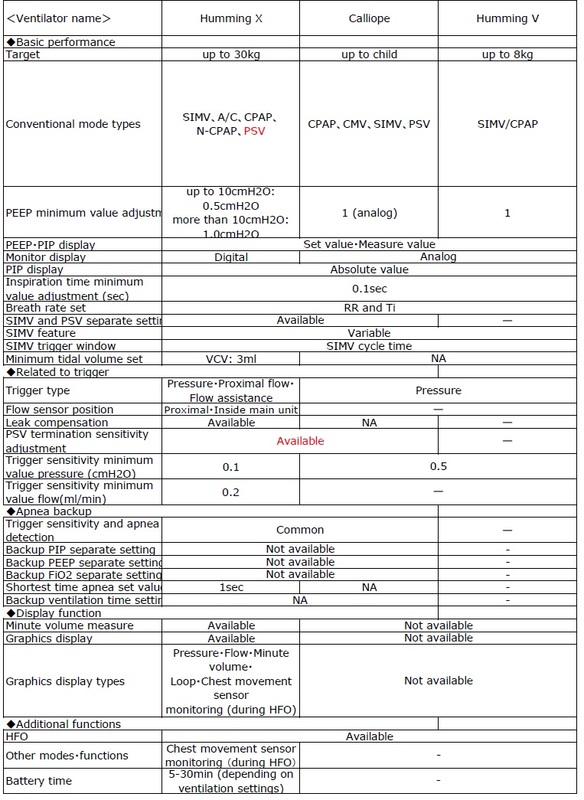 However, volume-limited ventilation is not currently recommended for use in neonatal medicine because the safety margins of maximum inspiratory pressure and inspiration time have not been preset (although maximum inspiratory pressure alarm is available it does not function as a limiter) in spite of the fact that minimum ventilation can be preset to extremely low levels such as 3 mL. 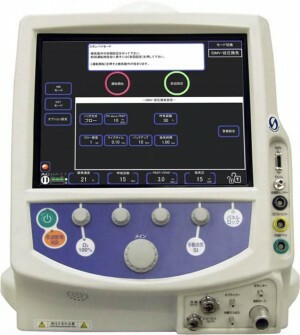 After pressure-limited ventilation is selected, either of SIMV or A/C (Assist Control) is selected. PSV is not handled as single respiration mode but handled as the function that is added to SIMV or CPAP. The purpose of the internal battery is to provide emergency power in case of a power failure in the hospital, and is not intended to be used as an alternate source of regular power. The battery takes 8 hours to fully charge, and while charging, the back-side power source must be turned on. This is similar to the requirement that the power must be turned on while charging regular UPS. Panel locks include semi-lock and full-lock. Semi-lock works when pushing panel lock button for 1 second and full lock works when pushing panel lock button for longer than 2 seconds. Semi-lock or full-lock at that time can be identified by the icon located on the lower right of LCD panel. Under semi-lock, presetting of oxygen concentration, 02100% button and manual air supply SI button are available. Under full-lock, all operations are locked. By pushing buttons with no units (mode switch, trigger system, flow volume waveform, etc. ), a sub-window will appear or alternately the button setting will change. Unless the “Alarm Confirmation” button is pushed after changing various settings, the alarm will continue to sound. In any ventilation mode, supplied oxygen concentration can be made 100% for 120 seconds by pushing “100% oxygen supply” button. In this case, LED in the button turns to green and switches to the display of 120 seconds countdown timer. Rise time means the time to reach preset maximum inspiratory pressure on inspiration. In this machine the rapidity of pressure rise on mandatory ventilation and PS is controlled by the rise time. This machine enables presetting of the rise time from 0.1 seconds to 0.9 seconds (but this rise time does not exceed the inspiratory times in SIMV and backup ventilation for CPAP). 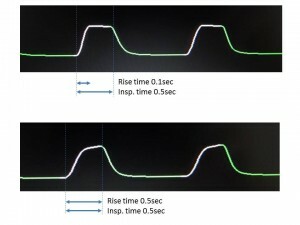 As shown in the figure, the shorter the rise time, the sharper pressure waveform becomes. The longer the rise time, the gentler the pressure waveform becomes. Same situation is reproduced, for example, by changing inspiratory flow rate in Babylog8000plus. When pushing the manual air supply button or SI button, air supply occurs at the set inspiratory pressure, inspiratory flow volume, inspiratory time (tidal volume in VCV) preset in SIMV or backup ventilation concerning CMV/CPAP. In this machine, since the same time as the inspiratory time is established as inspiratory dead band time so as not to reverse the I:E ratio, the next ventilation cannot be started until the same expiratory time as inspiratory time has completed after manual air supply. In HFO, SI for 30 seconds is the maximum time that can be actualized and, during SI, the SI pressure level and sustained time are indicated on the pressure data display. For the first 5 seconds, there is a dead band time when the SI high-pressure alarm does not actuate, therefore users must pay attention to obstruction of circuit, etc. during use. Moreover, return from SI to full HFO needs slightly more time comparing with other machines. When the main dial or quick dial fails for some reason, the HUMMING X has the function that allows for setting of values using a virtual knob displayed on the touch panel. 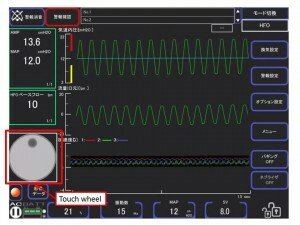 By selecting [Menu]  [Switch of operation]  [Touch wheel ON] on the main screen, the touch wheel will appear on the screen (Figure 2). In this case the touch function becomes effective on the items corresponding to the quick dial, meanwhile dial operation becomes ineffective. By appearance of the touch wheel, ventilation volume monitor will not be shown, although the ventilation volume can be called up by pushing the patient data button. 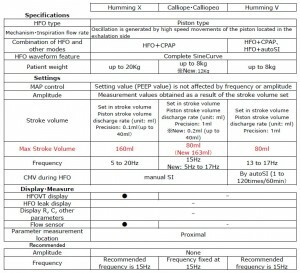 Concerning basic performance except for HFO, sufficiently improved specifications compared with competing conventional machines has been achieved even in the CMV field, which had been the weakness of mechanical ventilators for neonates, in that PEEP can be preset by 0.5 cmH2O up to 10 cmH2O, that flow trigger can be actualized by installment of a flow sensor, that the pressure trigger sensitivity has also increased from conventional 0.5 cmH2O to 0.1 cmH2O, that backup ventilation time can be separately preset, that diverse monitoring screens are installed and so on. PEEP/CPAP in CMV is preset by 0.5 cmH2O up to 10 cmH2O, while MAP in HFO is preset for each 1 cmH2O. There is no doubt that piston type HFO is the most excellent system in terms of the performance of HFO. Its basic principle has been already described in various references, therefore, its interpretation is omitted in this paper. Comparing with competing HFO machines, the piston type HFO has a stroke volume up to 160 mL and, on the other hand, can be preset extremely minutely by 0.1 mL up to 40 mL. In addition, the flow sensor on the proximal side has enabled real time display of ventilation volume. Thus, piston type HFO has come to combine power and fineness. The oscillation frequency can be preset in the range between 5 and 20 Hz but basically its use at 15 Hz is recommended. In HFO ventilation, this machine has 3-step pressure protection function consisting of auto-alarm against abnormal MAP, preset by ME mode, relief valve pressure and high and low MAP preset by alarm presetting. When changing preset of oscillation frequency to lower level in HFO machine, the ventilation volume generally sometimes abruptly elevates. There are no reasons in the specifications to change oscillation frequency from the viewpoint of power or fine presetting. Unless clear reasons are confirmed, it is desirable to use at 15Hz. 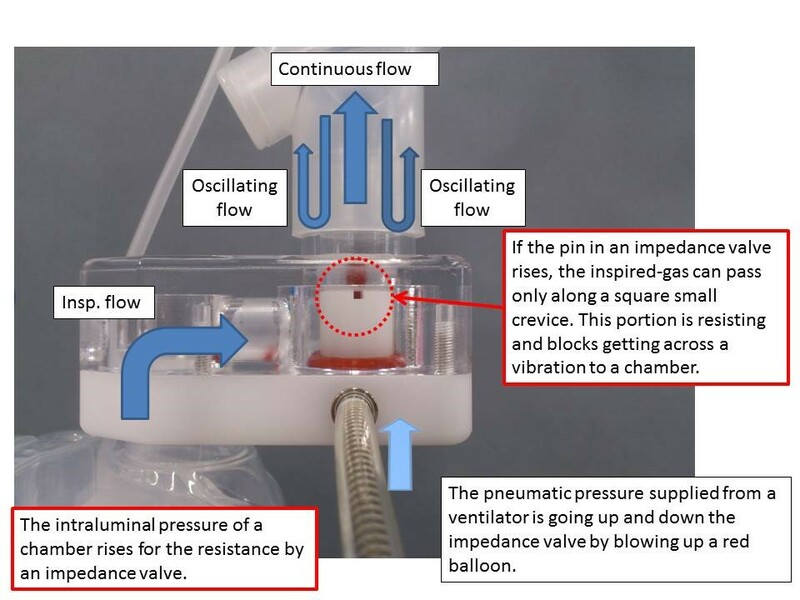 The impedance valve is an adjustable resistor in the inspiratory circuit and acts to suppress attenuation of the oscillation from expiratory side piston caused by the humidifying chamber which has larger volume compared with the respiratory circuit. 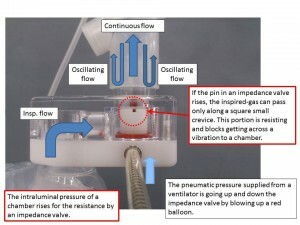 During HFO ventilation, a balloon inside the impedance valve inflates, causes elevation of a pin, thereby, allows continuous flow to run only through a square small gap and produces resistance in the inspiratory circuit, which prevents attenuation of oscillation, as shown in Fig.3-a. 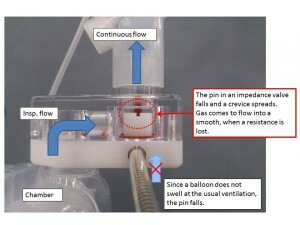 During regular ventilation, the balloon shrinks and lowers the pin inside. Thereby, continuous inspiratory flow can run smoothly (Figure 3-b). Moreover, the impedance valve produces resistance inside the inspiratory circuit and then inner pressure in the inspiratory circuit elevates. This must be cautioned on using auto-water supply type heating and humidifying apparatus. As shown in Table 3, some countermeasures such as application of not auto-water supply chamber but manual water supply chamber should be taken for use at large stroke volume and high base flow of 20 LPM or higher.